Vickers & Bear Collect Huge Paydays at Doorslammer Nats! JULIAN, N.C. – The 2018 Loose Rocker Promotions American Doorslammer Nationals raced into action on Friday with the Summit Racing Equipment $10,000 warm-up race at Piedmont Dragway. 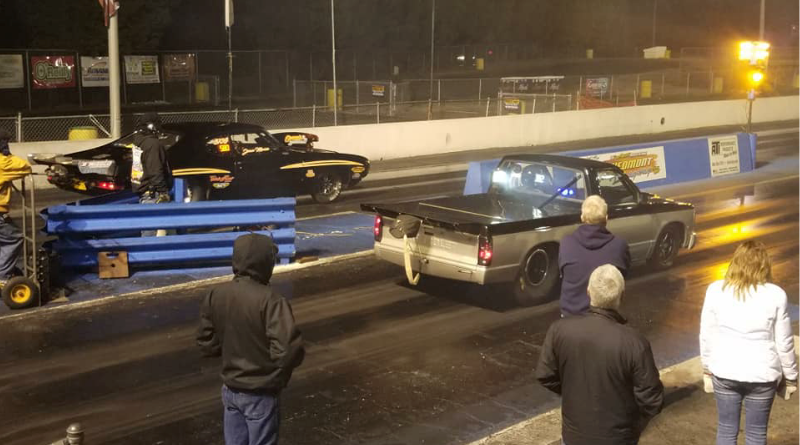 After a delayed start due to damp and cool weather conditions, action heated up as 245 competitors raced through eliminations until late in the evening. With 11 cars remaining, the decision was made to postpone the remaining rounds until Saturday morning as track conditions had deteriorated. The 11 remaining competitors included Jarred Kobe, Ernie Humes, Scotty Richardson, Justin Vickers, Steve Sisko, Shawn Carpenter, TG Paschal, Jeff Bowman, Bill Prest Jr., Tesz Powell, and Bobby Love. As eliminations progressed on Saturday morning it was Humes over Powell, Love over Bowman, Paschal over Richardson, Vickers over Sisko, Carpenter over Prest, and Kobe with the bye run. In the quarterfinal round Humes used his fourth consecutive .00 light to take down Kobe, Carpenter overcame Paschal’s .003 light to win the double-breakout race, Vickers defeated Love to set up up the semifinal round. Carpenter earned the semifinal bye which left Vickers and Humes to battle for the remaining spot in the final round. After both drivers posted .01 lights, Humes took .030 at the stripe in an almost heads up race to go -.001 under his dial while Vickers posted a safe .037 over 6.697 for the win. The final round matchup included two former Loose Rocker champions as Justin “Skirt” Vickers, Alliance, Ohio, was looking for his second American Doorslammer victory while Elm City, N.C. resident Shawn Carpenter, already a three-time Loose Rocker champ, was also looking to add another Loose Rocker Eagle trophy to his collection. “Skirt” drilled the tree in the final round taking a huge .007 to .056 lead at the tree. Vickers proceeded to clean it up at the finish posting a .028 over 6.688 for the win and his 2nd American Doorslammer Nationals title. After the Friday $10K was completed, the attention quickly turned to the Saturday ATI main event. A field of 271 competitors lined up for a shot at the ATI $20,000 to win prize and the coveted Loose Rocker Eagle Trophy. As eliminations progressed the field was reduced to just six competitors at the quarterfinal round including Chris Bear, TG Paschal, Ray Holmes, John Lassiter, Lou Greco, and Dink Holmes. In the round of six Bear used a .020 package to take down the .021 package of TG Paschal for a .001 margin of victory, Holmes moved to the semifinal round after Lassiter turned it -.002 red, and Greco used a holeshot to defeat Holmes. With just three competitors remaining and $20,000 on the line, Bear took the bye run to the final while Greco moved to the final courtesy of a .001 breakout by Holmes. Holmes, who posted a .028 reaction time, took .004 at the stripe but needed to take .003 or less after Greco was .031 total. Racing for $20,000 in the final round Chris Bear, Curtice, Ohio, and Lou Greco, Edinburg, Pa., put on a show with a heads up 5.80 drag race. At the hit Bear took the lead with .009 light in his S-10 to Greco’s right there .012 in his classic GTO. Bear captured the big payday by just .003 after both driver’s posted .016 over 5.816 E.T.’s. A super close race worthy of the big dollar final round. Sunday’s schedule includes a racer appreciation breakfast at 9.30am followed by the GodSpeed Ministries church service at 11.00am. New racer time trials will begin at 12.15pm with eliminations to follow for the Abruzzi Transmissions $10,000 finale. For more coverage of the 2018 Loose Rocker Promotions American Doorslammer Nationals or to watch live bracket racing online, click here. DragChamp is your source for big money bracket racing race results, visit daily for latest bracket racing news and information.